NASHVILLE, Tenn. (August 14, 2015) – After launching what Billboard called “country’s biggest digital experiment to date” with the streaming and digital release of his new single “21”– already resulting in nearly 21 million global streams of “21” in less than 10 weeks, and counting – Hunter Hayes continues to explore new ways to connect with his audience. Earlier this year, the tech-savvy artist collaborated with streaming music service Spotify to help route the upcoming 21 Tour by identifying college markets with a high density of passionate Hunter Hayes fans. The first round of dates for the 21 Tour are being unveiled today, August 14, with ticketing information and more dates to be announced in the coming weeks. For the 21 Tour, which will be a limited run of 21 dates in 21 U.S. cities, Hayes is scaling back from his current arena show to create a more up-close-and-personal experience for his fans. 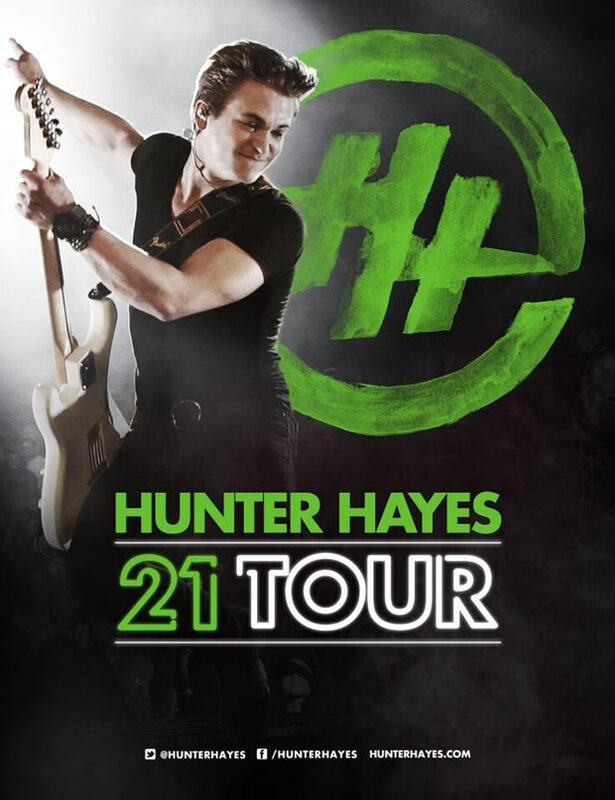 Together with Spotify, Hayes will reward his biggest fans in each of the 21 cities with pre-sale access to tickets, and offer the top 21 fans in each market prizes including early entry to the show, meet-and-greet opportunities, signed memorabilia, and more. The fan who streams Hayes’ music the most in each market will also be rewarded with a one-year subscription to Spotify Premium. Up-and-coming Nashville singer/songwriter Ryan Lafferty will open for Hayes on most dates on the 21 Tour, with chart-topping country artist Kelsea Ballerini joining as a special guest at the Nov. 5 show at Western Kentucky University in Bowling Green. Hayes will continue on the Wheels Up Tour with Lady Antebellum and Sam Hunt through the end of summer. For more information and the latest updates, visit www.HunterHayes.com or follow on Twitter / Instagram @HunterHayes and www.Facebook.com/HunterHayes. Hailed as a “country-rock-blues guitar hero in the making” by the Los Angeles Times, five-time GRAMMY nominee Hunter Hayes is a singer, songwriter and multi-instrumentalist who roared onto the music scene with his Platinum-selling, No. 1 self-titled debut album and chart-topping sophomore album, Storyline, on Atlantic Records. With three No. 1 singles already under his belt (including the multi-Platinum smash “Wanted,” “Somebody’s Heartbreak,” and “I Want Crazy”), Hayes delves into unprecedented territory with the digital and streaming release of his latest single, “21.” He is currently on the road with Lady Antebellum and Sam Hunt for the Wheels Up Tour and will launch his own 21 Tour this fall. For the latest updates, visit www.hunterhayes.com or follow on Twitter/Instagram @HunterHayes and www.Facebook.com/HunterHayes.